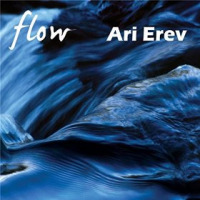 Flow, Israeli pianist Ari Erev’s new release, is a melodic set of mainly originals, that nods strongly in the direction of Latin and Brazilian music. He’s assembled a strong band with a core trio completed by Eli Magen on bass and Ron Almog on drums and guest appearances from percussionist Gilad Dobrecky and saxophonist Yuval Cohen. Jump Into The Water kicks of the session with a lively vamp, congas and drums locking with a leaping bass riff and Cohen’s soprano sax reeling out a catchy melody. He builds the excitement with a well judged solo before handing over to the pianist, leader. Playful Moments clips along with samba-like feel, Cohen demonstrating again an instinct for well turned phrase and injection of pace into his solo to increase the energy. Flow, a trio number showcases Erev’s other pre-occupation, with a classical flavoured, flowing melody and cycling harmonic sequence, providing a platform for his own and bass player Eli Magen’s melodic soloing. Gan Ha-Shikmim, by Israeli composer Yohanan Zarai, is in a similar vein whilst the balladic piece What the Heart Sees has a romantic flourish with Magen pulling out a singing, expressive solo. On Domingo Erev gives his lyrical side full rein on Brazilian pianist Deborah Gurgel’s gently lilting piece, with appealing interplay between the trio. The liner notes, written by Howard Mandel describe the music as soothing and stimulating, a fair summary. Erev shows an instinct for an attractive line and the band a liking for digging in, grooving and exploring the melodic possibilities. It makes for a very satisfying listen.